In the previous article, Masaccio had completed the polyptych for Pisa, and was still working intermittently on frescoes for the Brancacci Chapel in Florence. I will complete my account of his painting in that chapel before describing his final works. Masaccio (1401–1428), The Expulsion from the Garden of Eden (1425-8), fresco, 208 x 88 cm, Brancacci Chapel, Florence. Wikimedia Commons. The Expulsion from the Garden of Eden (1425-8) is probably the best-known section of fresco in the chapel, and was a frequent source of inspiration to Renaissance painters such as Michelangelo. Its composition and story are very simple: Adam and Eve are chased out of a gate from the Garden of Eden by an angel threatening them with a sword. Masaccio lights this from the upper right, and uses highlights and shadow to develop form and volume in a remarkable way. Eve’s facial expression is particularly impressive in its grief and misery. This has been cleaned and restored recently, and the inevitable fig leaves which had been painted on in the 1700s were removed. Raising the Son of Theophilus and Saint Peter Enthroned (1425-8) is one of the more elaborate paintings in the chapel, and was one which Masaccio worked on in 1427. It combines the narrative of the miracle performed by Saint Peter after he was released from prison with some early church history. He was taken to the tomb of the son of Theophilus, the Prefect of Antioch. The son had been dead for fourteen years, but the saint raised him from the dead. The boy is shown here amid bones from the tomb, his hands raised in amazement. Several of the figures are believed to show important Florentines of the day. The group at the far right is of particular interest: it is claimed that they represent (from the right) Brunelleschi, Alberti, Masaccio (as a self-portrait), and Masolino. However, Alberti and his family had been exiled from Florence to Genoa, and he was not allowed to return to the city until 1428; even then it seems very unlikely that he would have got to know Masaccio or Brunelleschi sufficiently well to appear in this way. In addition to the extensive modelling of garments and faces, Masaccio here manages fairly convincingly accurate two-point perspective projection. The Tribute Money (1425-8) is probably the summit of Masaccio’s achievement in the chapel. Based on a story from the Gospel of Matthew in which Christ directs Peter to find a coin in the mouth of a fish so that he can pay the temple tax, Masaccio restages it and paints a composite of the narrative. In the centre, the tax collector asks Christ for the temple tax. At the far left, as indicated by Christ and Peter’s arms, Peter (shown a second time) is taking the coin out of the mouth of a fish. At the right, Peter (a third time) pays the tax collector (shown a second time) his due. 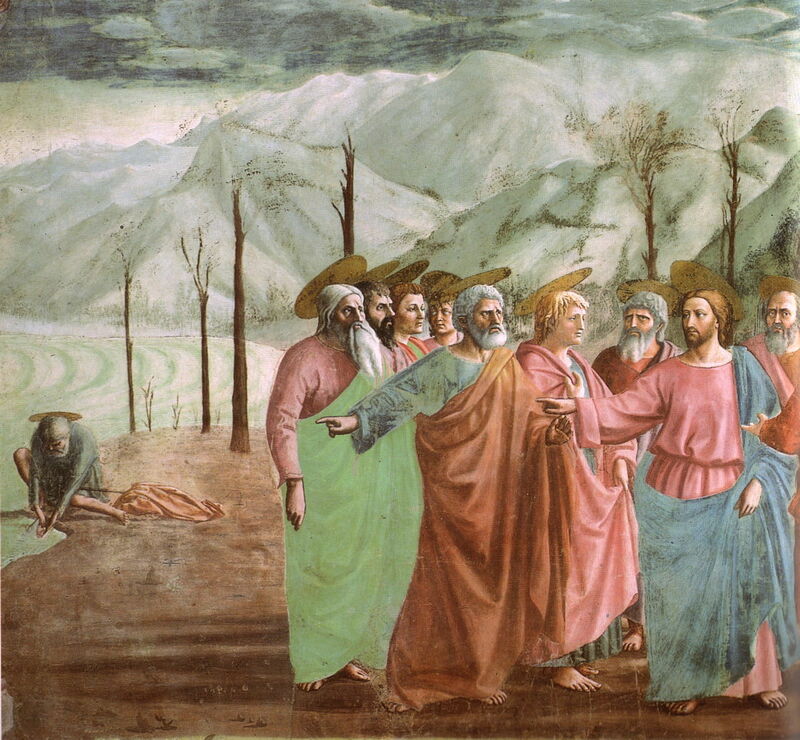 Masaccio’s figures of Christ and the disciples are modelled superbly here, each face given its own expression. One-point perspective is also used to great effect with the building, the vanishing point being at the head of Christ, and all the halos are also projected carefully. Masaccio (1401–1428), Madonna and Child (Madonna Casini) (c 1426-7), tempera on wood, 24.5 x 18.2 cm, Galleria degli Uffizi, Florence. Wikimedia Commons. This was painted as a private commission, probably for Antonio Casini, a cardinal from Siena. 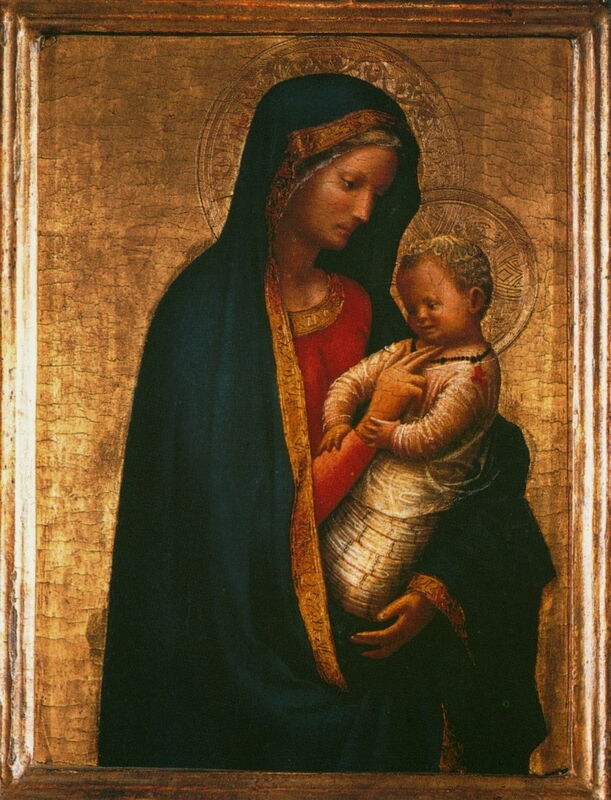 The Virgin Mary, wearing her dark ultramarine robe, is swaddling the infant Christ in her left arm. With her right hand, she raises two fingers to bless him, but these appear to be tickling his neck; this accounts for this sometimes being known at the tickling Madonna. Christ also wears an unusual coral necklace, known as an apotropaic amulet, to bring good fortune. Another innovative feature is the three-quarter view of the Madonna. In 1427, Masaccio was commissioned to produce a fresco on the Holy Trinity for the church of Santa Maria Novella in Florence. The painting’s patrons are thought to be the man shown to left of the Virgin, and his wife to the right of St John the Evangelist, from the Berti family. This shows the traditional Christian Trinity of God the Father (top), God the Son or Christ (on the crucifix), and God the Holy Spirit (white dove flying from God the Father). At the foot of the crucifix are the Virgin Mary (left) and Saint John the Evangelist. The tomb at the bottom of the painting is that of Adam, the first man. The inscription on that tomb reads Io fui gia quel che voi siete e quel ch’io sono voi anco sarete: I once was what now you are and what I am, you shall yet be. Masaccio required at least 28 days of fresco painting, judging from the areas covered in each session. For the first time in any painting, its perspective projection was realised by rigorous geometric means: Masaccio placed nails in the plaster, incised lines into its surface, and used ropes to project accurately to the vanishing point below the base of the cross. These are shown in detail in the superb movie produced by the National Gallery of Art, Washington DC, here on ArtBabble. This was not only the first major painting which uses strict linear perspective projection, but was also the first trompe l’oeil painting, giving the optical effect of another chapel receding through the wall on which it is painted. This could only have been accomplished by meticulously accurate perspective projection, and careful choice of the vanishing point so that it looked right to the viewer. 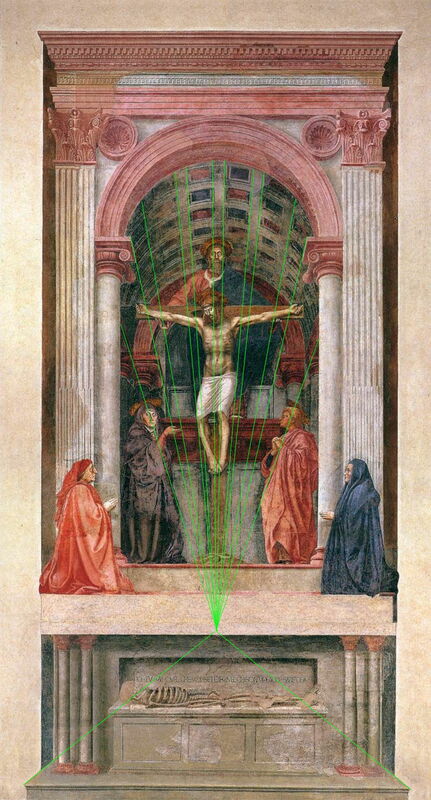 Over the previous couple of years, in his fresco paintings in the Brancacci Chapel, Masaccio showed that he was capable of using not just one-point but even two-point perspective. However, as I explained in my earlier article, Brunelleschi had only recently discovered linear perspective, and Alberti had not yet written his book On Painting explaining how to use it. It is perfectly possible that, by this time, Masaccio had learned the skills and techniques which he had to use in order to paint this extraordinary work. However it is much more likely that he was at the very least aided by, and probably worked throughout with, someone who understood the geometrical theory and intricacies of perspective. The two principle sources of information about perspective in Florence in the period 1425-1435 were Brunelleschi himself, and Alberti. However as I have pointed out above, Alberti was in exile in Genoa, and was not allowed back into Florence until 1428, by which time Masaccio had solved the problems and the painting was probably complete. Furthermore when Alberti did return to Florence, he needed time to learn from Brunelleschi before he would have known any more than Masaccio already did. Donatello, the sculptor, was a close friend of Brunelleschi and might have been able to work with Masaccio on perspective. However, he was probably away most of the time working on commissions in Pisa and Siena. I therefore consider it most likely that Brunelleschi himself should be credited for his major contribution to this painting. Masaccio (1401–1428), St Jerome and St John the Baptist (1428), egg tempera on poplar wood, 125 x 59 cm, The National Gallery, London. Wikimedia Commons. It is not clear whether The Holy Trinity or this painting was Masaccio’s last work. This painting was another made jointly with Masolino, who had been working on a polyptych for the altar of the Basilica of Santa Maria Maggiore in Rome. Masaccio’s panel shows Saint Jerome, dressed in a cardinal’s scarlet robes and hat on the left, and Saint John the Baptist, looking rugged on the right. Masaccio’s modelling of volume is superb, and the faces most lifelike and expressive. Small details, such as the lion at the lower left, and the flowers at their feet, are shown in excellent, realistic detail. Masaccio has brought painting from the flat icons of the Gothic into a new age of Renaissance realism. In the spring or summer of 1428, Masaccio left for Rome, probably to meet Masolino who was then working on a fresco in the Basilica di San Clemente. Later, probably during the summer, he was reported to have died there, at the age of just 26. Although some have suggested that he was poisoned, it was much more likely the result of infectious disease or an accident. These two articles have shown almost all the surviving paintings of Masaccio. I have omitted a couple which remain very contentious, and a couple which are too damaged to make much out. In his career as a master in his own right, which spanned just over six years, Masaccio almost single-handedly founded the southern Renaissance in painting. Some of his major advances, such as the modelling of faces, surface anatomy, and clothing, were advances to the developments which had already been proceeding in the hands of Giotto and other predecessors. For many decades to come, the examples which he left in his frescoes in the Brancacci Chapel were an inspiration to the painters who continued to shape the revolution wrought by the Renaissance. In his implementation of linear perspective projection, he led the whole of Europe: his Holy Trinity is, in this respect, one of the most important and influential paintings in the world, a true masterpiece. All that in just six short years. Excellent NGA movie about The Holy Trinity on ArtBabble. Article here on the early history of linear perspective. Posted in General, Painting and tagged Alberti, Brunelleschi, Donatello, Masaccio, Masolino, painting, perspective, renaissance. Bookmark the permalink.